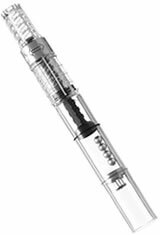 The Pilot CON-40 fountain pen converter fits most Pilot cartridge converter style fountain pens. Pilot pens use a proprietary ink cartridge and can only use Pilot converters as well. Each Pilot CON-40 converter comes with a clear plastic body to see the ink level. Inside are small ball bearings to agitate and keep the ink fresh. The converter has a small twist knob to control the piston within the converter to fill with fountain pen ink. The Pilot CON-40 Fountain Pen Converters usually ships within 1 business day unless otherwise specified. Each Pilot CON-40 Fountain Pen Converters we sell is guaranteed to be genuine, authentic and will arrive brand new & unused! The Pilot CON-40 does exactly what it's supposed to do... I used this to replace the squeeze converter that came with my Pilot Metropolitan, and I'm quite happy with that decision. The converter contains three steel balls to keep the ink mixing, and I've experienced only flawless functioning of this converter. I cannot get this new model more than 2/3 full, which is frustrating. The prior design (with the black twister) seemed much better! The Pilot CON-40 converter works just fine for me. I bought one of theseconverters with the four tiny balls that help ink from staying at the top of the converter for my Pilot Metro Retro Pop (fabulous fountain pens, by the way!) because I couldn't tell how much ink was left in the press style converter that came with the Metro. The press converter is a fine utilitarian converter and I'm certainly keeping it as a contingency, but I'm glad that I got the CON-40 replacement. It doesn't fill to the top, but few pens do and anyway an air pocket is a good thing for flow. The tiny balls are nifty for getting the ink from sticking at the top of the converter. They work. The clicking sound is so soft in my converter that I don't notice a click when I use the pen. Flushing ink residue from the converter has not been a problem for me. And I simply shake out any water that remains after I've expelled cleaning water from the CON-40. I will order more of these for a couple other Metros that I have - love the colors of the Retro Pops. The CON-50 is much better. This CON-40 seems to hold less ink, causes burps often, and the twist knob is more difficult to use. Not a great fan about the CON-40. Doesn't draw sufficiently enough ink in the converter. So I end up priming the pen then removing the converter to fill it by sharing. This converter is a pain to clean, and doesn’t hold a ton of ink. Otherwise, it works incredibly well, keeping the ink from sticking to the back of the converter. Works great in the Pilot Metropolitan pens. The agitator balls work well for shimmering inks. No complaints. Wish it had a little more ink capacity.